DYNASTY hit an unhappy landmark. 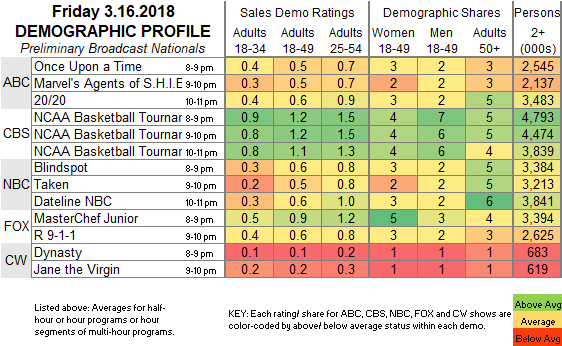 CBS: Preliminary ratings for the night’s NCAA TOURNAMENT games were at 1.2/1.2/1.1, down from last year’s parallel night and its 1.4/1.8/1.4. However, there was a historic upset game happening on TNT, which may account for the CBS shortfall. ABC: ONCE UPON A TIME (0.5), AGENTS OF SHIELD (0.5) and 20/20 (0.6) were steady. NBC: BLINDSPOT remained at 0.6, while TAKEN gained 0.1 to 0.5, and DATELINE was up 0.2 from last week’s Megyn Kelly news special to 0.6. FOX: MASTERCHEF JR held at 0.9, followed by a 9-1-1 rerun at 0.6. CW: DYNASTY hit a new low, dropping 0.1 to a dismal 0.1, although it skews older than stable-mate JANE THE VIRGIN (steady at 0.2), so its Total Viewers number was higher. The NCAA TOURNAMENT continues on CBS tonight, and SATURDAY NIGHT LIVE is hosted by Bill Hader, with musical guest Arcade Fire. Tomorrow, CBS premieres INSTINCT, NBC launches GENIUS JUNIOR, and BROOKLYN NINE-NINE returns to FOX, while on cable Showtime’s THE CHI airs its season finale.